Random Number Generator for Excel (ZRandom) implements a high quality pseudo-random number generator for Microsoft Excel. Use the high quality Mersenne Twister algorithm to generate better pseudo-random numbers than the limited Excel RAND() and VBA Rnd() functions. High quality random number generation can be applied to analytical business applications such as probability analysis, simulation studies and cryptographic key generation. The Excel RAND() and the VBA Rnd() functions use very simple algorithms to generate pseudo-random numbers. In some Excel versions, the RAND() can even generate negative numbers! If a high degree of randomness or a large quantity of random numbers are required, these functions should not be used. 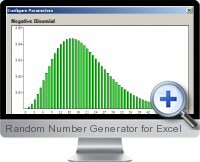 Random Number Generator for Excel uses the Mersenne Twister algorithm to generate pseudo-random numbers, one of the best algorithms available. Mersenne Twister is very fast and has a cycle period of 2^19937 - 1. Generate random numbers from 16 discrete and continuous distributions. Pseudo random numbers can be generated from each distribution using the distribution wizard, directly in a spreadsheet cell using the excel functions and in VBA using the VBA functions. Distributions included are: Bernoulli, Beta, Burr, Exponential, Gamma, Geometric, Hypergeometric, Lognormal, Negative, Binomial, Normal, Pareto, Poisson, Triangular, Uniform, and Weibull. Functions for use in spreadsheet formulas. The Mersenne Twister generator and all implemented distributions are implemented as excel formula's and can be accessed in spreadsheet cells and as part of other functions. The Random Number Generator for Excel functions ZRAND and ZRANDBETWEEN accept an optional seed and can return both single cell values and arrays for even greater speed. A VBA interface to generate random numbers in your code. Just add a reference to 'ZRandom' and use Random Number Generator for Excel. Next and ZRandom.NextBetween to generate random numbers, or use one of the functions to generate random variables from a probability distribution like NextPareto or NextHypergeometric. Generate large amounts of random numbers interactive user interface. Selecting Fill from Distribution from the Tools - ZRandom to enter the distribution wizard: 1. Choose a distribution, 2. Configure the parameters, 3. Choose an output method. Generate random samples from a table. Select a block of cells to sample from choose the Sample item from the Tools - Random Number Generator for Excel sub menu. The samples will be place on the clipboard and can be pasted anywhere. Random sort existing data. Select a block of cells and choose the Random Sort item from the Tools - ZRandom sub menu.